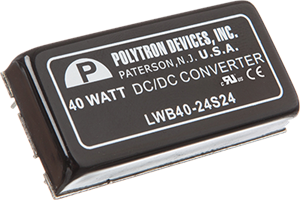 At Daburn Electronics & Cable, we offer an impressive variety of DC-DC converters through our Polytron Devices division. Our comprehensive inventory spans a range from half a Watt to 200 Watts, with a wide variety of output types and packaging options. With dozens of options available for a range of applications, our DC-DC converters are available with single, dual, or triple output, as well as wide and ultra-wide input ranges. They are useful in many different industries, including rail transportation and the medical field. We also offer custom designs to meet your application. Please call for a quote or a custom design today. With a large range of designs available, we classify our DC-DC converters into seven different groups based on their power usage: Please click a link below to see a full listing of our standard DC-DC converter power supplies. 0.5 to 3 Watt More than 20 series options in this category, built with single or dual output. Feature variations include internal SMD construction, continuous short-circuit protection, reinforced insulation, high-performance pi input filters, low noise, epoxy encapsulation, or no minimum load requirements. The SWU2/MHIA and TWB3/MHIA5 series are recommended for medical applications. 5 to 12 Watt Most of these converter series are available with single and dual output, while some have 2:1 or 4:1 wide input ranges. Built-in features include continuous short-circuit protection, over-voltage protection, fixed switching frequency, miniature packaging for tight spaces, six-sided shielding, or low output noise. Several series are useful for medical applications, including the TWA6/MHIA and the TWB6/MHIA5. 15 to 30 Watt This category includes more than 20 series of converters, most of which have single and dual output, a few with triple output. Features include fixed switching frequency, short-circuit or over-voltage protection, internal input fuses, six-sided metal shielding, epoxy encapsulation, and no minimum load requirements. The LWA15 series is ideal for medical applications, with several others recommended for the rail industry, like the DMWB30 series. 40 to 60 Watt Polytron carries ten series of converters in this category, several offering triple output models in addition to the single and dual. The LWB40 and DMWB40 series are perfect for railway applications. 75 to 200 Watt Fourteen series options in this wattage range, some of which are ideal for applications in the railway sector, including the HWB200 and the FWB150. 15 to 30 Amp Three more non-isolated, point-of-load converters with high efficiency.